Black Cape is cape that is lying to the open sea just across the Sombeki island. Just behind the cape, there is a sea light named same with the cape with all its majesty. Sailors around this region call this cape "bread thrower". If you watch them, these sailors throw a few pieces of bread after they turn from this cape. This is a gratitude showing to God as "Thanks to God, I pass this cape without any accident." 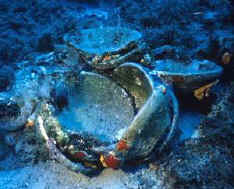 Maybe Loryma , the plate ship was once a ship that didn't throw bread to sea. She strucked to the one of the steep rocks just near the cape and sunked to the 39 meters. There is wind and waves around this cape usually. There is always a good show of the waves hitting to the empty spaces between rocks near the place. Because of the wreck being just near a perpendicular rock formation, the general color around the wreck is dark blue. 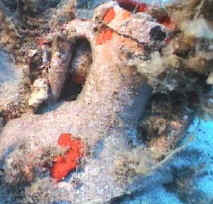 Just after the sand is started being seen in 30 meters, the broken amphoras that belong to the ship can be seen. 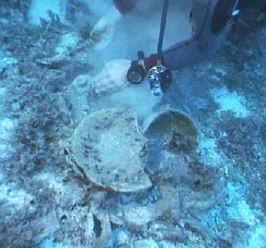 There are a lot of broken amphoras and a few unbroken around the wreck and there is a few plates around them.